As our conversations continue to explore changes in the workplace, the #futureofwork hashtag has materialized seemingly out of nowhere. It’s rapidly catching on. You might say it’s caught up with us. Our last 3 chats on org futures tapping Laloux’s ideas have helped lay the groundwork. You may see some of his thinking in our topic outline, below. Echoes of our conversations on Wheatley are there too. But even more catalyzing, to me, is Deloitte’s recent Tom Friedman interview, hosted by CEO Cathy Englebert and senior strategist John Hagel. Have a look, prior to the chat. Then let’s use our chat space to distill a few of the key elements for our upcoming #futureofwork conversation, with inputs from Christy Pettit, Allison Honery and me. As always, lots to talk about, with some new ideas on how we frame and unpack changes in the workplace. Join us MON 8/18 from 9-10:30pm ET to lay out and prioritize series topics. There’s enough content for a solid 6 months of monthly chats. I think it’s worth devoting a chat to a roadmap. Think of it as our chat agenda. Stop in for the conversation. It’s always lively. ABOUT THE GROUP. Over the last 5 years, a small group of OD thinkers has been discussing the future of the organization, using hashtag #orgdna. Small, of course, is relative. Our number of active contributors has hovered around 20-25, but any given month, there are 5-10 of us engaged in a dialog on the future of work. Please join us. The chat is open to all. For the chat itself, we recommend a tweet streaming app like TweetDeck. Just add #orgdna (and optionally, now, #futureofwork) to your tweets, and we’ll see you at the appointed hour. ABOUT THE AUTHOR. A thinker, instigator, and explorer of edges, Chris Jones has been unpacking the forces at play inside organizations for 30 years. Find his thinking here on the #orgdna blog, on Medium – or for his deepest dive, over on Amazon. Change is all around us. It is our 21st century zeitgeist, our greatest challenge, and our daily focus. What are we doing about it? We had 5 #orgdna chats August-December 2016 with a focus on culture change, with a progressive level of input and engagement. To me, that says we’ve tapped a topic that resonates, and gathered a group with much to say about it. As we close 2016, we are looking forward to resuming book reviews in early 2017. As we transition, we used our final December chat on 12/19/16 we put some stakes in the ground on the org culture topics we’ve covered this year. What have we learned so far? What are the key takeaways? Here our five 2016 Org Culture transcripts, providing much of the insight on that. Q1. Culture w/ Scale: silos vs. networks; can we predict how much structure is needed? Q2. Culture, in Time: do we act: early? often? what are the signals? Q3. Change Skills for Culture: how do we build empathy that ensures deep listening? Q4. Leadership Skills for Change: how do we align w/ change in markets, workforce demands, in the zeitgeist? Q5. Adaptation w/ Complexity: can we instll flexibility at the edges? As we start planning for 2017, I hope you’ll continue to join us 3rd MONDAYs at 9pm ET. The community is still growing. We’d love to add your voice and your insights. In terms of mechanics, just access the conversation via your Twiter account. We’ve found success using a streaming app like TweetDeck. Just be sure to embed #orgdna in your tweets .. and we’ll see you online !! Culture Change, the Dilemma of the 21st Century Organization: Can Leaders Keep Up? How do you develop a culture that embraces and enables change? Leaders and executives are continuing their search. In fact, the dilemma of culture has been much discussed in the press, even before IBM’s Lou Gerstner took the challenge head-on in the 1990’s. He said IBM’s culture was the single biggest challenge facing the company’s gut-wrenching transformation from hardware sales to services. The company needed to rethink itself. The culture needed to change. Culture is the set of beliefs and values that emerge when a group of stakeholders have interacted over time. They influence it, and are influenced by it. It is how the group models success, and the ground rules for survival. With that frame, the challenge is clear. Convincing an established group that the rules have changed doesn’t tend to work, at least not on the first few tries. The problem is further complicated by a broad lack of understanding. Most haven’t been exposed to the prevailing theories from an organizational development (or “OD”) perspective. If Drucker is right and culture resists definition, do we dare look further? Not to challenge Drucker, but in this case, I say ‘yes’. Edgar Schein advanced a model that cultural forces operate in layers, where beliefs and values effect us in different ways at different times, but all of them operating together. As examples, he mentioned our citizenship, our ethnicity, our professional training, and our gender, all operating in tandem with our workfplace culture. The values and behaviors passed down among each of these affinity groups play a role when we respond to a an issue, make a decision, or challenge the status quo. Charles Handy is known for 4 discrete cultural archetypes, each operating in organizations, sometimes side by side with one another, but having unique properties. With 21st century forces in mind, I adapted Handy’s 4 archetypes just slightly into the categories of Command, Role, Network and Practitioner. I created a visual some years back to recap and expand on Handy’s model. I’ll include the graphic here. Four Types of Organizational Culture, from Handy (1993). 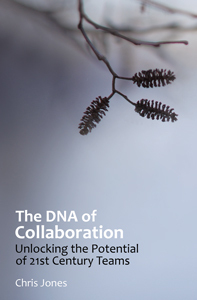 “The DNA of Collaboration” (c) 2012, Chapter 10, Fig. 15. As we unpack the forces of culture change in the 21st century, we should keep Schein’s layers and Handy’s 4 archetypes top of mind. They help us understand what’s at stake. With that as background, let’s discuss the 21st century implications, with overlays of complexity and our recent focus on systems thinking. We’ve been talking about the dual dynamics of structure and flow in the organization. This conversation should advance our thinking in all of these areas. Q1. Layers. How do the Schein’s layers of culture interact during times of transformation? How do they effect the structure? Q2. Archetypes. Can you confirm any of Handy’s 4 archetypes in organizations you’ve seen? Are they at times at cross purposes? Which archetype maps to the modern silo? Q3. Network. The network model has proven well-suited to learning and adaptation. Is it necessarily the path for the 21st century organization? Does it model structure, or flow? Q4. Scale. Does scale necessitate the Role/Function model, or is there another approach? I hope you will join us Monday, August 15, from 9-10pm ET, as we discuss the Dilemma of Culture Change. Just sign onto Twitter at the appointed time, and use hashtag #orgdna in your tweets to join in the conversation. We recommend a Twitter streaming app, like Tweetdeck. It’s always a lively conversation. See you there! Corporate Culture Survival Guide (1999), Edgar Schein. Understanding Organizations, 4th ed. (1993), Charles Handy. The DNA of Collaboration (2012), Chris Jones; chapter 10. The Dilemma of Culture.